Nars Spring 2013 is bold and uninhibited. This collection I find is more of a “pick one and I’m done’, as they are hard to mix the two duos, Mad Mad World and Bouthan, into one cohesive look without looking like you came “Back to the Future” with Micheal . J.Fox in his snazzy Delorean (Ok I am giving away my age!). So I was satisfied to walk away with just one piece of Nars spring 2013, and Bouthan it was. A stunning hot 80’s pink offset by a soft baby pink. The bright pink is shot through with gold sparkle. It is very buildable. TIP: It actually works very well over Rouge Bunny Rouge Unforgettable Oriole for a more Suqqu-esque pearlescent finish. I did have fallout, so if you are not a fan off ‘sparkly-face’ syndrome, then walk on by. The bright pink is pretty much matte, making it on the harder side to blend. The baby pink is very sheer with sparkle too and was hard to see on my skin tone. I went for a full on look that is not for the tame. 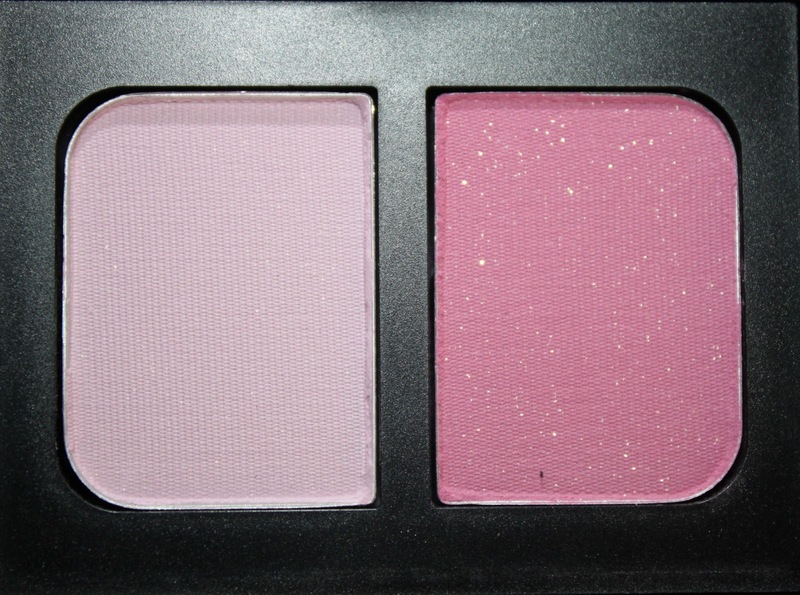 Bright pink over the lid and blended into the crease with the use of the baby pink shade. I used a soft black liner with a hint of a flick to stave off the dreaded pink rabbit eye that can come with a pink shadow. I kept the lower lash line clear and fresh. I wore Stila All you need is love on my cheeks (reviewed here) and Tom Ford Smitten on my lips (reviewed here). Mascara at maximum. The focus is on the eyes for this look. I do think if you are very fair, this pink could look like a case of conjunctivitis but for warmer skin tones it plays off nicely to create a modern twist. Blue eyed beauties, this will make your eyes ‘pop’. The formula is ok for a matte (need to get som RBR creaminess here), but I do love (tis the power of love! compliments to Huey Lewis) the shades of pink offered. So if you too wanted to be Molly Ringwald in ‘Pretty in pink’, part grunge part funk, this duo is made for you. It did stay on all day, is my last say on the matter. So if this post is so full of cliches of the 80’s, lets just keep it between friends- because ‘that what friends are for’! Did Nars spring 2013 rock your world?